Now that I have a garden of my own, I'm dusting off the old garden trains and track that have been in storage for years. The old system had two locos and a second-generation LGB MTS system with two controllers and wireless, purchased some time between 2002 and 2004 (my memory is a little foggy on the exact year). One of the locos was an LGB with a built-in decoder, the other has a more standard LGB decoder. Is it worth it to keep my old MTS system, or should I just spend the $$$$ to buy a whole new system? Depends on the version of the MTS system. If it's MTS 1, throw away. MTS 2 maybe keep and upgrade as long as it has the "P" option. MTS 3 is probably ok.
You say one loco had built in decoder, other "more standard"? Based on your level of expertise, I'd go DCC++ all kinds of options and way more features. There's more about this on LSC. One loco is a LGB Mikado with the built-in decoder (I think one of the first that LGB offered with built-in decoder). The other is a Bachmann outside frame Consolidation. I did the decoder installation years ago, and I can no longer remember which brand of decoder I used, but I'm pretty certain it isn't an LGB decoder. Later MTS2 components that are parallel-capable are marked with a small round black sticker with a white "P" on it. If such a sticker is not present, then it is an earlier Serial-only item. To operate in Parallel mode, ALL components of the system (Central Station, control handset and both radio receiver and transmitter modules if using wireless) must be "P" enabled. I'd agree with Greg, if it is an MTS2"P" set-up then it is an obsolescent but still perfectly useable system; MTS1 or MTS2 Serial (early) is pretty much obsolete. 1. Get some track down, and run something..
2. Build your own DCC++ system..
3. Ditch the old MTS.. So it turns out the arduino motor shield I have in my parts bin is a 12-amp version (don't judge me!) and I can probably make that work with DCC++ with about a day's work. I'm starting to get track down, but it's been raining a lot so I may build up the DCC++ system indoors first. All MTS systems are 14 speed steps only. The MTS III can be 28 speed steps and over 23 engines with a Massoth Navigator. Newer systems are 14/28/128 speed steps and can address up to 9999 and some a little higher, and are more than 5 amps. I looked for having 24 volts on the track and over 10 amps which leave many systems in the dust or needing boosters, but you need separate tracks for each booster. The Zimo has a 12 amp operator output plus an 8 amp program track and these can be tied together for 20 amps. Of course this comes at a price not all are willing to pay. Well, in case anyone else is curious, the Pololu Dual VNH5019 Motor Driver Shield for Arduino that I have won't work for DCC. The data sheet says it has a maximum switching frequency of 20kHz (just fast enough for DCC), but that's only for on/off operation. It takes about 200-1600 microseconds to switch polarity, which is too slow to generate the 1 bit for DCC. Looks like I'll have to check out other motor shields and that Zimo system. There is a circuit using one transistor and a couple of resistors to make it work. I've used a couple for a few months now with no problem. I am in a similar situation. I have moved three times, and now have two kids. It’s been at least seven years since I’ve used my sysrem. I have an LGB MTS II-P system. 55005, with a factory painted P on the front case. While the pololu doesn’t look fully comparable, there is an H-bridge solution available to work with an Arduino based system. Dave Bodnar has posted videos about the solution on you-tube, and has full assembly information on his website. Use it until it dies Whiskey. It is quite sufficient for basic running but you probably wont be able to get it mended when it finally fails. What Throttle have you got to go with it? - Or do you call them 'Cabs'?? I got the central station, remote, and amplifier working yesterday. It works a treat after sitting in the box for the last 12 years. I have built an XP-based PC virtual machine, I plan to install the MTS software on it this week sometime. I realized I have quite a backlog of locomotives to convert to DCC. All of my current inventory is chipped with the 55021, is there a consensus as to a good replacement for this part? The Massoth L decoder is a direct replacement for the old 55021 (or the even older 55020 for that matter) - it has the same physical size and pin setup, so like the 55020/55021 it can be plugged directly into the main board on a "Direct Decoder" LGB loco. If you want the simplest possible straight replacement for a 55021, then the L is the thing you need; the L also has a SUSI socket for connecting things like the Dietz/Uhlenbrock sound modules if you wish. The Massoth M is a miniature decoder designed primarily for use in the LGB Feldbahn locos (a direct replacement for LGB's "small loco decoder") - it has the usual four wire connections for the gearbox, but accessing any other functions (for lights etc) requires some very careful soldering to the tiny pads on the decoder board. 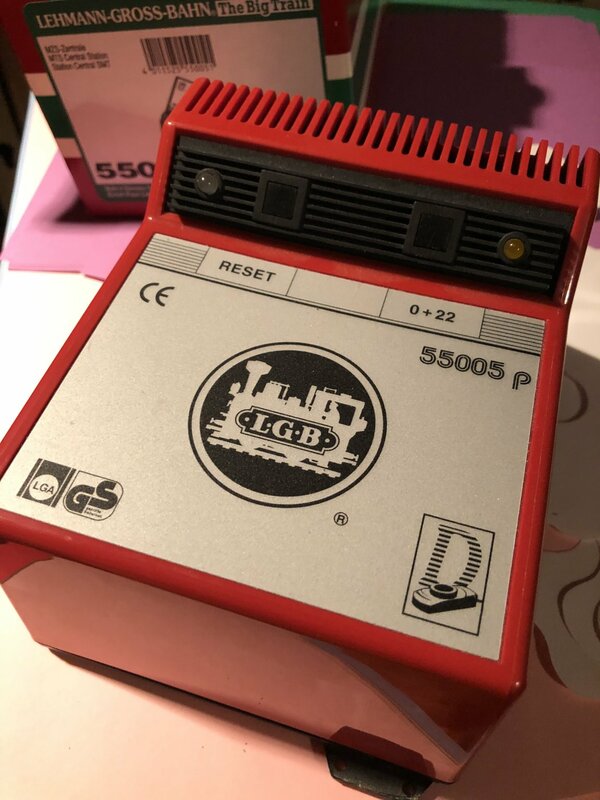 While the M does have enough power handling for most single-motor LGB locos, it's not really a good replacement for the standard LGB 55021 decoders. Well, I picked up one of the IBT-2 H-bridges ( the "Semiconductor Motor Driver Auto BTS7960 43A H-Bridge PWM Drive For Arduino L1E7 " ) recommended by LGeoB, and I have it happily up and running with DCC++ on my Arduino. Control from JMRI on my computer seems OK so far, and the WiThrottle iPhone app for JMRI makes a nice throttle. My LGB MTS system works fine and my favorite locos work well with it. If I just wanted to keep playing with trains, I'd probably keep using it until it died. I want add more locomotives, switches, signals, detection, and eventually layout automation. I don't have the computer interface or input modules for the MTS system, and my MTS is old enough that it doesn't support parallel mode. Instead of spending money on obsolete parts for the MTS system (which are still expensive! ), I'd rather spend money on system where I can still buy parts. That means a new system, a different used system, or DIY. I like playing with electronics and software, and DCC++ was cheap, so I went that route. If I wasn't an electronics nerd or didn't want to put the effort into building and maintaining my own system, I'd probably buy one of the Massoth or Zimo systems. Am back to using my MTS II since the SPROG died. I personally really find it better NOT to have a laptop computer involved in the network. This is supposed to be relaxing, not a challenge. This is supposed to be relaxing, not a challenge. You have not seen the state of the garden I have to 'tame' before I build the permanent way..